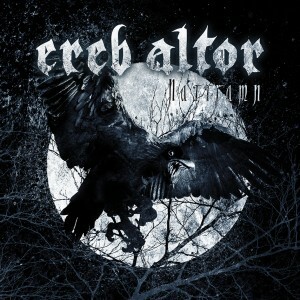 Formed in 2003 by Mats, vocals, bass, keyboards, guitars, and Ragnar, keyboards, drums, vocals, bass, guitars, from ISOLE EREB ALTOR is all about the pre-ISOLE band FORLORN, and also a sort of homage to BATHORY. Completing the line-up are Mikael, vocals and bass, and Tord, drums. This is their fifth album since 2008, and their output has increased seriously since the meagre demo they made in 2003-2008. Their prima opus “By Honour” was more in the vein of BATHORY´s magical “Twilight of the Gods” (1991), and will thus remain my favourite. But here we find the style I personally think they started developing from 2010´s “The End” onwards. More black-ish elements, growl, hysterical keyboards, you know the sound. This removed them slightly from the doomy Viking metal throne I awarded them early on. But they still rule at making intros, “The Son of Vindsvalr” is no exception, there´s epic atmosphere in bucket loads! “Middsommarblot” then carries the torch with its chanting vocals and almost catchy melody. The title track almost has the grooves of CANDLEMASS, not least in the massive opening part, but the growl part takes out the finesse. “The Dance of the Elves” is more of the right stuff until the croaked growl reappears. From then on the rest of the album is more laden with growl, and therefore not my bag. There are so many flamboyant melodies, violins, riffs but it doesn’t really explode other than in “Across the Giant´s Blood” where everything adds up and they don´t end up in the growl ditch. I understand what they are looking to achieve, but I don´t approve. BATHORY were another kind of brutality too. Please prove me right on that account when the next album comes along!